Dealerships just love it when you trade in your old vehicle. Why? They give you "wholesale" for it (if you're lucky) then "retail" it to another customer, charging that customer thousands more. Dealerships typically make more even if they sell your trade directly to an auto auction or wholesaler. If your vehicle is older, but nice, reliable and paid for, selling it yourself may make particularly good sense. Why should the dealership make that extra money? Why not pocket that money yourself by selling your car to an individual rather than trading it? If your vehicle is older, but nice, reliable and paid for, selling it yourself may make particularly good sense. Many people are looking for very affordable, but reliable transportation. So you can take a vehicle that a dealer might give you just a few hundred or thousand for and make more money. Both you and your buyer can come out ahead. Of course, you can also do well selling a newer vehicle. Here's the way to sell those wheels yourself. Clean it up. Most buyers pay more attention to how a vehicle looks than to how it runs. A clean, shining car says you've taken care of that vehicle. So clean it thoroughly—inside and out. If you're too busy, have the car "detailed" at a cleaning center. Fix all the minor problems. If the radio or air conditioning doesn't work because of a fuse, for example, change it. If the floor mats are really worn, get new ones. Worn belts and hoses? Change them. Have the oil changed. Consider getting a full inspection and report from your mechanic to show potential buyers. Determine an "asking" price. Search online dealer advertisements for cars like yours, and make your asking price close to theirs. If you still owe money on your vehicle, call your lender for the payoff; your asking price needs to be high enough to pay off your loan and provide a profit. Keep some negotiation room in your asking price, unless you are willing to say your price is "firm" and stick to that. Determine the vehicle's true wholesale value. This is the amount a dealer would ideally give you for your old car if you traded it. The only way to tell exactly what your car is worth in your local market is to shop it at three or four local used-car sales centers (new car dealerships or stand alones). Your highest offer is the vehicle's "wholesale" value. But most people aren't willing to do this. Instead you can get an average wholesale value for your region using an online pricing guide (such as Edmunds, NADA Guides, or Kelley Blue Book). Fix all the minor problems. Determine the vehicle's true wholesale value. Determine the minimum profit you want to get. Write a short advertisement and take photos. Again, if you still owe money on your auto loan, call your lender and get the payoff. The minimum price you are willing to accept must cover your loan payoff and the profit you desire. Write a short advertisement and take photos. Use online car ads that catch your attention to help you write it. And always include the phrase "no trade." Don't forget your contact information. Photos in online ads help attract potential buyers. Don't forget to use Facebook, Twitter and the like to let your social network know you have a vehicle for sale. Posting a print ad on work and community bulletin boards can also be effective. Get ready to sell. Locate your title (if the car is paid for). Gather together your vehicle's records. Service records can be a real selling point. Consider purchasing a vehicle history report (such as those offered by Carfax.com or AutoCheck.com) to show it's not been in an accident, etc. Get a bill of sale ready. Even if your state doesn't require one, it can provide extra clarity in the transaction. Also check with your state's Department of Motor Vehicles to see if they have specific forms or steps for use in the transfer. Most states have such information online. Screen potential buyers first. When people inquire about the car, set up a preliminary phone call, rather than just use email or texts. Over the phone you can encourage good prospects and discourage those that aren't serious buyers or send up a red flag. Arrange for buyers to see and test drive the car. Most serious customers want to look over the car and test drive it. Make an appointment for them to come to you at a public place such as local coffee shop or work parking lot. I recommend that you have a friend with you. Ask to see the buyer's driver's license and record the information before you go on a test drive with them. If they don't wish to show their license, stop the transaction right then. Keep this information until the sales transaction is complete then destroy or delete it. Together, set up a vehicle inspection if requested. Smart buyers may wish to have the vehicle checked out independently by a mechanic. Although the buyer should arrange and pay for this, you should take the vehicle to the diagnostic service. 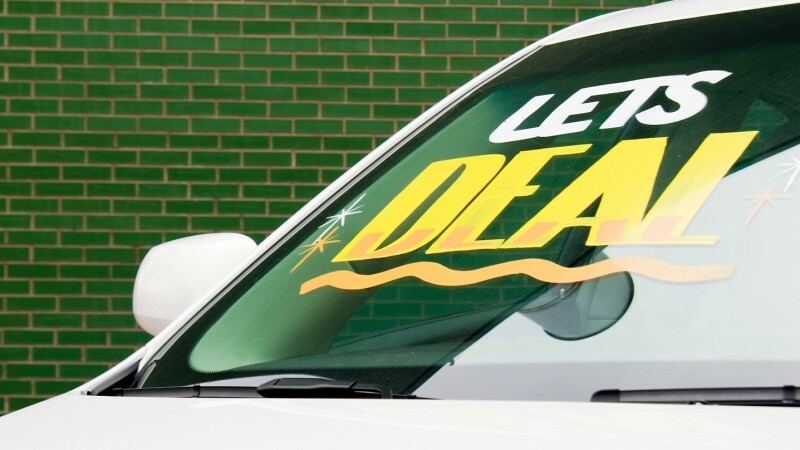 When a potential buyer is ready to make an offer on your vehicle, prepare to negotiate. Remember today's vehicle buyers have access to online pricing guides. Expect them to have checked average wholesale, retail, and "private seller" prices. Expect them to make a first offer well below what you want. Use our tips to prepare to negotiate successfully. Stay alert for potential fraud. Particularly when selling your vehicle online (though it can happen in face-to-face sales), you must stay alert for fraudsters. If someone agrees instantly to your asking price, then says they want to send you a certified check or money order for more than the price (an overpayment) and have you send them the balance, say "no sale." This variation on the "Nigerian Scam" has spread widely. In another variation, they may ask for your checking account number so they can "wire the money" to you. Instead, they will steal your money and possibly your identity. Your best protection: If any one wants you—the seller—to give them—the buyer—money or your personal financial information, don't do it. Also if you are considering using an escrow service, check the service out thoroughly, do not automatically accept the one proposed by the buyer. Unfortunately escrow scams abound, too. Make out two copies of a bill of sale that identifies the vehicle (make, model, year, VIN#), sale price, and buyer and seller (with addresses/phone numbers). You will also eventually transfer the title to the buyer, but not until you have your money and, if you have a loan, have paid it off and received the title from your lender. Make an appointment with the buyer to receive payment, complete the title transfer, fill in any other forms your state requires (such as a smog statement) and turn over the vehicle. If the buyer pays by certified check, when you receive it, call the issuing financial institution and verify the check before turning over your car. If the check is good, fill out the title to complete the transfer. If you must pay off your auto loan before you can receive the title and transfer it to the buyer, you may be able to complete the sales transaction with the buyer at your lender's office. If not (perhaps your lender is out-of-state), then you and the buyer can go to the Department of Motor Vehicles which will issue the buyer a temporary permit to operate the car. Make arrangements with the buyer to complete the title transfer when you've received it; the buyer will need it to properly register the car in his/her name. Handle the transfer or removal of your tags/registration in accord with your state's laws. After the sale is complete, discontinue the insurance on the car you no longer own. You decide: on average, fifty percent of the people who try to sell their car themselves succeed, and those usually make at least a thousand dollars more than if they had traded it. How hard do you work to earn a thousand these days?